The Onondaga (Onöñda'gega' or the People of the Hills) are one of the original five constituent nations of the Iroquois Confederacy (Haudenosaunee). Their traditional homeland is in and around Onondaga County, New York. They were centrally located among the nations, with the Cayuga and Seneca to their west and the Oneida and Mohawk to their east. For this reason, the League of the Iroquois historically met at the Iroquois government's capital at Onondaga, as indeed the traditional chiefs do today. Their Longhouse serves as a place of spiritual, cultural and social activities, the seat of government and symbol of security. Contemporary Onondaga are found in the Six Nations of the Grand River reserve in Ontario, Canada. Like other member-nations of the Haudenosaunee, the Onondaga Nation survives today as a sovereign, independent nation, living on a portion of its ancestral territory and maintaining its own distinct laws, language, customs, and culture. Still, Onondaga culture continues to change and evolve to meet the challenges of the modern world. The Haudenosaunee concern for both personal and societal consideration of the seventh generation, that is to act in such a way that seven generations from now will benefit, informs their efforts. Onondaga today have much to offer human society, and their best representatives continue to offer that to the world. The Onondaga, since the time of their ancestors, have inhabited an area of what is now upstate New York in the vicinity of Onondaga Lake and the Oswego River. 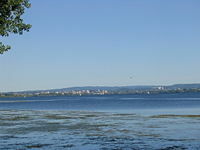 Onondaga Lake is just south of Lake Ontario and northwest of the present day city of Syracuse, New York. Water outflows from the lake to Lake Ontario through the Oswego River. Around 1450 or possibly earlier, Onondaga Lake was the site of the founding of the Haudenosaunee (Iroquois Confederacy). According to legend, at this spot the warlike Onondaga chief Tadodaho was persuaded by Hiawatha and Deganawidah (the Peacemaker) to accept the Great Law of Peace. The Iroquois Confederacy (Haudenosaunee), complete with a constitution known as the Gayanashagowa (or "Great Law of Peace"), was established prior to major European contact. The exact date of its establishment is not known, although it has existed continuously existed since at least the fourteenth or fifteenth century. Oral tradition tells of how the Seneca, Cayuga, Onondaga, Oneida, and Mohawk people had been warring against each other causing great bloodshed. To address this, the Creator sent a messenger to remind the people of the true lifestyle so that they could live in peace. The two spiritual leaders, Ayonwentah (generally called Hiawatha due to the Longfellow poem) and Deganawidah, "The Great Peacemaker," brought the message of peace to the five tribes. In their travels to find the leaders of the five peoples, they came upon a woman who gave them shelter. She accepted their message and the Peacemaker set aside a special duty for women, the "Clan Mother." According to legend, an evil Onondaga chieftain named Tadadaho was the last to be converted to the ways of peace. Tadadaho was said to be so evil that his body was twisted and snakes grew from his head. Hiawatha and the Great Peacemaker "combed the snakes" from Tadadaho's hair and he accepted the message, becoming the spiritual leader of the Haudenosaunee. This event is said to have occurred at Onondaga Lake near Syracuse, New York. The title, Tadadaho, is still used for the league's spiritual leader, the fiftieth chief, who sits with the Onondaga in council. The combined leadership of the Nations is known as the Haudenosaunee, which means "People of the Long House." The term is said to have been introduced by the Great Peacemaker at the time of the formation of the Confederacy. It implies that the Nations of the confederacy should live together as families in the same long house. 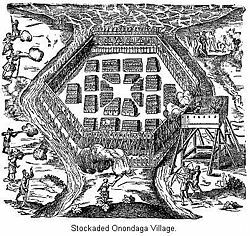 Being centrally located with the Cayuga and Seneca to their west and the Oneida and Mohawk to their east, the Onondaga were charged with keeping the flame of the Council Fire burning in the council longhouse where the council of the confederacy met. Thus they were known as the "Keepers of the Fire," Kayečisnakweˀnì•yuˀ (Rudes 1999). A sixth tribe, the Tuscarora, joined after the original five nations were formed. Sketch by Samuel de Champlain of his attack on an Onondaga village. Once they ceased most infighting, the Confederacy rapidly became one of the strongest forces in seventeenth and eighteenth century northeastern North America. The Haudenosaunee engaged in a series of wars against the French and their Iroquoian-speaking Wyandot ("Huron") allies, another Iroquoian people but a historic foe of the Confederacy. In 1615, Samuel de Champlain was escorted through the Peterborough area by a group of Hurons. He used the ancient portage between Chemong Lake and Little Lake (now Chemong Road). The party passed Lake Ontario at its eastern tip where they hid their canoes and continued their journey by land. They followed the Oneida River until they found themselves at an Onondaga fort. Pressured by the Hurons to attack prematurely, the assault failed and they were forced to flee. By 1677, the Iroquois formed an alliance with the English through an agreement known as the Covenant Chain. Together, they battled the French and their Huron allies. In the American Revolutionary War, the Onondaga were at first officially neutral, although individual Onondaga warriors were involved in at least one raid on American settlements. After an American attack on their main village on April 20, 1779, the Onondaga later sided with the majority of the Haudenosaunee and fought against the United States in alliance with the British. Thereafter, many Onondaga followed Joseph Brant to Six Nations, Ontario, after the United States was accorded independence. On November 11, 1794, the Onondaga Nation, along with the other Haudenosaunee nations, signed the Treaty of Canandaigua with the United States, in which their right to their homeland was acknowledged by the United States in article II of the treaty. Like other Iroquois, the Onondaga used to live in long housees, large bark homes which could be as much as 200 feet (61 m) long and functioned as a communal clan home. While they adapted to European influences and moved into cabins that housed nuclear families in the nineteenth century, the long house remains an important symbol of the identity of the Haudenosaunee, which means "people of the long house." The Onondaga lived as hunter-gatherers, and grew corn, beans, and squash. These were known as the "Three sisters" and were considered special, the first to have been given to the people by mother earth, and songs were sung to give thanks for the work they did to support the people. As hunters, the Onondaga ate deer, turkey, rabbit, and other game, sharing whatever they did not need with other members of the community. In the spring, they could also gather plants, such as wild onion, dandelion, and milkweed. In summer, strawberries were enjoyed, and were also considered special as they grow so close to the earth. Special thanks were also offered for them each year. The dress of the Onondaga was made from animal skins—dresses, leggings, moccasins, and aprons were all fashioned from the hide of deer. When the Tuscarora joined, they were called the "shirt wearers" because they used hemp to make decorative shirts. The distinctive feature of the men's dress is their headgear called gustoweh, a hat made of strips of wood decorated with feathers. Each of the Six Nations has a different style of feathers, with the Onondaga gustoweh containing one feather pointing upwards and another pointing downwards. Onondaga language (Onöñda’gega’ (IPA /onũtaʔkekaʔ/), "People of the Hills") is the language of the Onondaga First Nation. Other spellings of their name include Onontakeka Oneida Language and Onondagaono Seneca Language. This language is spoken in the United States and Canada, on the reservation in central New York state and near Brantford, Ontario. An English-Onondaga dictionary provides an invaluable tool for the teaching and preservation of the Onondaga language (Woodbury 2003). Like all Iroquoian languages, Onondaga is a polysynthetic language, meaning that many grammatical and lexical concepts are expressed as morphemes (that is as affixes of one complex word) rather than separate words. This means that many concepts which could take many words to express in English can be expressed in a single word in the Onondaga language. The Haudenosaunee have a clearly structured system of government, established by their constitution. There are 50 Hoyane (chiefs), with a specific number allocated to each nation. The Onondaga have 14 chiefs who participate in the council. The position of chief is held for life. When a chief dies a new one is selected by the Clan Mothers, matriarchs of the clan. They observe the behavior from childhood into adulthood of the men, watching their actions as adults to see if they possess the qualities of a leader. When a man fulfills the qualities he is selected to replace the one who departed. The Clan Mother is very important in the culture, not only in selecting the chiefs but also in determining when the council should meet and ceremonies be held. The Clan Mothers are responsible for ensuring that the ways and traditions are kept. There are nine Onondaga clans, each representing an animal: Wolf, turtle, beaver, snipe, heron, deer, eel, bear, and hawk. The clans are matrilineal—lineage is transmitted through the mother. Marriage is exogamous—one's spouse must belong to a different clan. Onondaga, like all Haudenosaunee, have a spiritual belief system that involves a Creator who gave the people their way of life. Caring for mother earth is an important duty, and this is expressed through ceremonies which give thanks to the Creator and all of creation for still performing their duties. An especially important ceremony is conducted at the beginning of the lunar New year, called Midwinters. It involves giving thanks and celebrating life on the earth, and engenders a feeling of harmony with the Creator. Other important ceremonies include those for strawberries, maple sap, beans, corn, and harvest. The "Faithkeepers" are responsible for determining when these ceremonies should be performed. Onondaga ceremonies include songs and dances that celebrate and give thanks to the living world for providing food, shelter, and other necessities of human life. Songs are accompanied by drums and rattles. Drums are made of cedar wood with deerhide stretched over the top. Horn rattles, made from a hollowed animal horn, are played to accompany the drummer. Turtle rattles, made from the snapping turtle, are sacred and used only for special ceremonies. Great care is taken of these rattles as the turtle sacrificed its life to participate in the ceremonies. In the early nineteenth century the teachings of Handsome Lake became popular among the Haudenosaunee. Handsome Lake was a Seneca who taught about Jesus and blended the traditional celebrations with Christian-style confessions of sin, in particular urging Native Americans to stay away from alcohol. His teachings eventually were incorporated into the Longhouse religion, which continues to have followers today. Many Onondaga, who are considered the most traditional among the Haudenosaunee, participate in the Longhouse religion. Handsome Lake's body is buried next to the Ononondaga Longhouse near Nedrow, New York (Waldman 2006). Contemporary Onondaga are found in the Six Nations of the Grand River reserve in Ontario, Canada. In the United States, members of the Onondaga Nation live in Nedrow, New York outside Syracuse. Like other member-nations of the Haudenosaunee, the Onondaga Nation survives today as a sovereign, independent nation, living on a portion of its ancestral territory and maintaining its own distinct laws, language, customs, and culture. The Onondaga Nation consists of a 7,300-acre territory just south of Syracuse. The Nation is still governed by a Council of Chiefs. These traditional chiefs are nominated by clan mothers. Onondaga culture continues to change and evolve to meet the challenges of the modern world. The people live in frame or modular homes, and work as teachers, retail clerks, and various professional organizations outside the Nation, or for the Nation itself, at the Onondaga Nation’s healing center, school, fire department, and hockey and lacrosse arena. Unlike several other New York native nations, the Onondaga Nation has chosen not to become involved in the casino business or other gambling ventures; instead, the Nation operates a tax-free smoke shop which sells tax-free cigarettes 24 hours a day. The revenue from this businesss funds many community projects, including the repair of homes, a reservation water system, a healing center, and the Onondaga Nation multi-purpose arena. Opened in 2002, the 1,900-seat facility, Tsha’HonNonyen Dakwha’, doubles as a venue for both hockey and lacrosse, not only for Onondaga, but for neighboring high school and college teams as well. 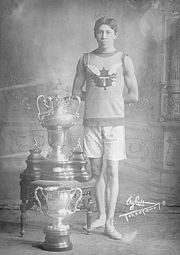 Cogwagee (Thomas Longboat) (June 4, 1887–January 9, 1949) was an Onondaga distance runner from the Six Nations of the Grand River First Nation Indian reserve near Brantford, Ontario, and for much of his career the dominant long distance runner of the time. He began racing in 1905, finishing second in the Victoria Day race at Caledonia, Ontario. His first important victory was in the Around the Bay Road Race in Hamilton, Ontario in 1906, which he won by three minutes. In 1907, he won the Boston Marathon in a record time of 2:24:24 over the old 24-1/2 mile course, four minutes and 59 seconds faster than any of the previous ten winners of the event. He collapsed, however, in the 1908 Olympic marathon, along with several other leading runners, and a rematch was organized the same year at Madison Square Garden in New York City. Longboat won this race, turned professional, and in 1909, at the same venue won the title of Professional Champion of the World in another marathon. He was a courageous competitor and served his country during World War I as a dispatch runner, taking messages from post to post under difficult and dangerous conditions. Yet for all his fame and excellence, Tom Longboat had to struggle against the vicious racism of his age (Kidd 2004). 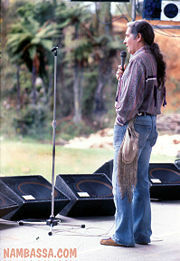 Oren Lyons (b. 1930) Oren R. Lyons is a traditional Faithkeeper of the turtle Clan of the Onondaga. He was born a member of the Seneca Nation and of the Six Nations of the Iroquois Confederacy (Haudenosaunee), and was raised in the traditional culture and practices of the Iroquois on the Seneca and Onondaga Indian reservations in northern New York state. After serving in the Army, he graduated in 1958, from the Syracuse University College of Fine Arts. He then pursued a career in commercial art after he moved to New York City. 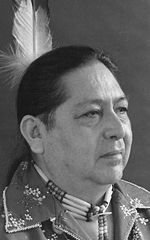 In 1967, he became a faithkeeper for the Turtle clan and returned to Onondaga with his family. He became deeply involved with national and international issues that affect native peoples and represented them in many forums throughout the world, including several at the United Nations focusing on the rights and status of indigenous peoples, the environment, and sustainable development. 1794. The Canandaigua Treaty of 1794. Canandaigua Treaty Commemoration Committee, Inc. Retrieved October 24, 2008. Calloway, Colin G. 2004. First Peoples. Boston, MA: Bedford/St. Martin's. ISBN 0312398891. Hodge, Frederick Webb. 2007. Handbook of American Indians North of Mexico 2 Volumes. Library Reprints. ISBN 978-0722238301. Kidd, Bruce. 2004. Tom Longboat (The Canadians). Fitzhenry and Whiteside. ISBN 1550418386. Moyers, Bill. 1991. "Oren Lyons—The Faithkeeper." Interview with Bill Moyers, Public Affairs Television, July 3, 1991. Retrieved October 24, 2008. Rudes, Blair A. 1999. Tuscarora-English / English-Tuscarora Dictionary. Toronto, ON: University of Toronto Press. ISBN 0802043364. United States Census Bureau. Onondaga Reservation, New York. Retrieved October 24, 2008. Woodbury, Hanni. 2003. Onondaga-English/English-Onondaga Dictionary. Toronto, ON: University of Toronto Press. ISBN 080203733X. This page was last modified on 20 December 2018, at 16:41.